Guwahati, Mar 8 : Rosemary Dzuvichu stands out among the few women in Nagaland who have launched a crusade against corruption, violation of human rights, killings, gender bias etc. Her endeavour, so far, has raised many eyebrows in the male-dominated Naga society but she is going about with her job fearlessly, hoping to see a Nagaland immune to the social evils. A human rights activist and a gender consultant who is also trained in conflict resolution, Rosemary is associated with a number of organisations both within and outside Nagaland. She is a senior faculty in Nagaland University in the department of English and has represented India and Asia as a panelist to several world conferences. The activist observes that the customary laws and practices have been the biggest stumbling block for women’s empowerment, both politically and socially, in Nagaland. “Women in Nagaland do not enjoy equal social and political status with men. They do not enjoy land, property or inheritance rights as per the customary laws. In sharp contrast with the Hindu Succession Act and the Muslim Personal Law, the Naga customary laws do not recognise inheritance or property rights even if you are the only child or daughter. So, when a man, who doesn’t have a son, dies, the property and land will be inherited by a male relative who may be five or six cousins away in family line,” Rosemary says. She points out that discrimination against the girl child is evident from the high rate of school drop outs. She attributes the phenomenon to the family’s compulsions to continue educating the boys, poverty, early forced marriage, early employment for girls to look after brothers and siblings etc. “Women are kept out of bounds of the traditional decision-making bodies such as the village councils in most villages where women are not even allowed to attend or listen to council deliberations. Nagaland has 1110 villages implementing one fourth reservation of seats for women in village development boards. However, in most villages, it is only on paper as there is a mindset opposing change and government has no political will to ask for accountability in implementation”. Rosemary says the men always use the customary laws and practices as an excuse to exclude women in all spheres thereby violating their rights. The biggest tragedy of women in Nagaland is that there has not been the slightest change in their position in the society over the years. Rosemary says battered by years of discrimination, the women in Nagaland have now launched a movement to assert their rights. In 2011, the Joint Action Committee on Women Reservation, of which Rosemary is the co-convenor, had moved the court challenging the government to implement the Nagaland Municipal First Amendment Act 2006 and 33 per cent reservation for women besides demanding holding of municipal elections. 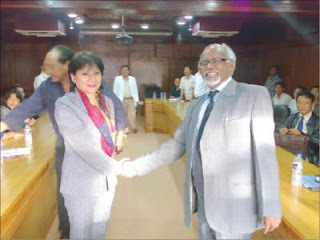 Subsequently, the court gave judgement in their favour but it was opposed by tribal bodies and even the state government that culminated in the government’s passing a “shocking resolution” in the legislative assembly to exempt Nagaland from part 1X A of the Constitution which gives reservation to women. Rosemary says the government’s position forced them to move the apex court. The case will be heard on March 11. The activist asserts that women groups such as the Naga Mothers’ Association (NMA) and several others have vowed to continue their fight for women’s right to peace and security. A single mother with two sons and a daughter, Rosemary cited gender-bias as a major problem facing the Naga women. “Nagaland again has failed to elect a woman legislator this time but we are positive that time will come when we have to send serious contenders into the electoral process. But I still see reservation as the best option in lower level of village and towns and municipals”. The activist has written on gender, socio political issues, development and peace with special emphasis and focus on the north-east and Nagas and their experiences over the years. She says patriarchy and its strong mindset dictates lives of most Naga women but she has been lucky to have lived and been treated like a son by her father. Being a Catholic church-leader, he is deeply gender sensitised and lives according to Christian principles of equality for all, she sums up.